Portsmouth (pop. 188,000) used to be the largest naval base in the world in the heyday of the British Empire. Nowadays, it is still home to the Royal Navy and remains an important naval base. 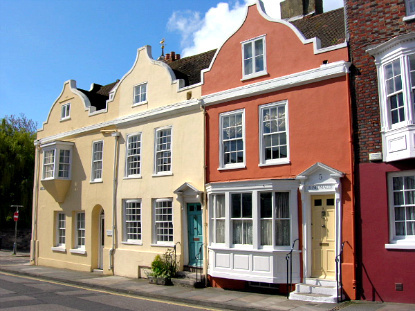 Portsmouth is also Charles Dickens' birthplace (his house can be visited). The strategic importance of Portsmouth during WWII made it one of the most heavily bombed cities in England. Therefore there is not much historical left standing, apart a few cobblestone streets around The Point and the Old Town, which are great for walking when the weather is nice. Note the Cathedral of St Thomas of Canterbury, an interesting jumble of architectural styles. The recently refurbished Gunwharf Quays is now home to the city's most modern shopping centre, comprising many cloth outlets, restaurants and a cinema. The Spinnaker Tower, constructed between 2002 and 2004, is 110m high and acts as Portsmouth new landmark and symbol of modernity. Further south along the seafront are the Bluereef Aquarium and the Southsea Castle. Portsmouth's main tourist attraction is the Naval Heritage Area (Portsmouth Historic Dockyard), known as Flagship. If you are not into warships, you are out of luck, because that is practically the only thing to see there. Given the high admission price, don't bother if you only have a limited interest in maritime history. 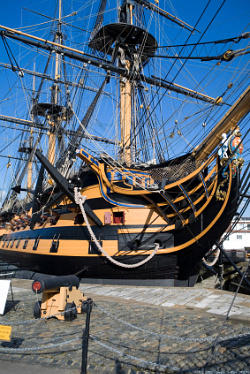 There are three ships open to the public: Admiral Nelson's HMS Victory, with which he defeated Napoleon's navy at Trafalgar in 1805; the Mary Rose, built between 1510-1511, sank in 1545 and was recovered from the bottom of the sea in 1982; and the HMS Warrior, a Victorian era ironclad steamship. The adjoining Mary Rose Museum retraces the recovery efforts and history of the doomed vessel. Admission to each ship cost about £7, but the passport ticket, also covering most of the museums, cost £18 and is valid for 7 days. Still in the Naval Heritage Area, the extensive Royal Navy Museum has all it takes to satisfy the most afficionados of historical warships, including an exhibit entirely dedicated to Admiral Nelson. Since 2001, the Action Stations has been showing a 25min (PG-rated) action movie called "Command Approved". The movie's budget came to £16 million and is bound to be a hit with young boys. All the attractions above are open daily from 10am to 5:30pm (until 5pm from November to March). 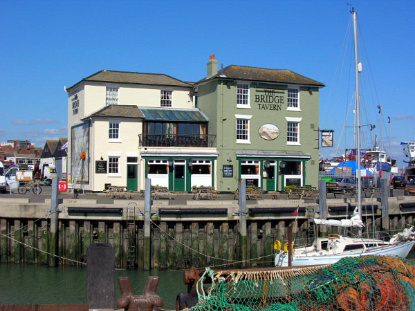 Gosport, on the other side of Portsmouth Harbour, has a couple of other maritime museums. If you have always dreamt to jump into a submarine, your wish will come true at the Royal Navy Submarine Museum (admission £3.75). The new Museum of Naval Firepower (admission £5) will initiate you with the horrors of naval war. It's full of special effects and feel pretty much like being in the middle of the action. 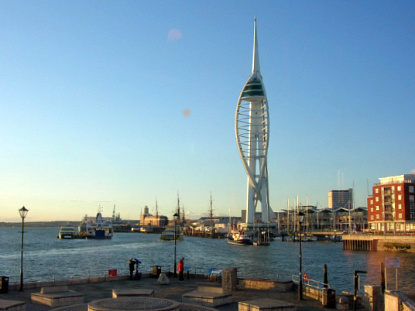 Portsmouth is about 100km south-west of Central London, to which it is connected via the A3 motorway. 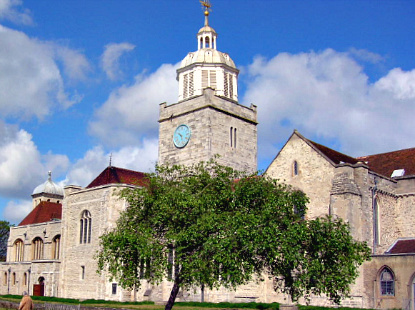 Southampton and Chichester are about 25km away and easily accessible via the M27 motorway. Trains run between Portmouth and London's Victoria or Waterloo stations (1h30min, £20.10), Brighton (1h20min, £13.90), Chichester (25min, £5.20), Winchester (1h, £8.20) and Southampton (1h, £6.80) . National Express buses link Portsmouth to London (£11, 2h15min), Brighton (£7.50, 1h45min), Chichester (45min to 1h10min, £3.20), Winchester (1h20min, £3.60) and Southampton (45min to 1h, £2.80).